South Lake Tahoe completely remodeled Chalet close to lake & casinos! Stay in style in this updated chalet and be close to the beach, the lake, casinos and shopping! 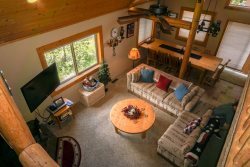 This 3 bedroom plus loft, 2 bath cabin is centrally located in South Lake Tahoe and perfect for the family who wants to have fun! This home was a family's South Tahoe retreat for 30 years before the owner decided to gut it and turn it into the beautiful vacation home that it is now. Remodeled in the summer/fall of 2016, the owner spared no expense when updating his cabin. From the outside, it looks like a typical "A-frame" Tahoe cabin but from the inside, the home screams luxury. The living room and kitchen are open concept with exposed wood beam ceilings. The kitchen has granite counter tops, new appliances and all new wood cabinets. The floors are a new light wood and the furniture is brand new. The living room has a large flat screen TV, WIFI, cable and new couch. The lower level has 2 bedrooms and a full bathroom. The upper level has the 3rd bedroom, full bathroom and huge loft area. The backyard is large but unfenced and the front yard has a nice little porch with a BRAND NEW GAS BBQ! The surrounding forests provide a great escape for your hiking and biking pleasures. You can't beat this neighborhood for privacy and closeness to the lake. In fact, there is hiking access on the same street. You can reach the popular Powerline trail a few houses down! Ski Run Blvd is just a minute down the road and another minute to the casinos and Heavenly Village. The nearby Heavenly Village offers shopping, Gondola rides, skiing and boarding for all ages and the casinos bring in big name entertainers of all genres year-round. Bring your bike, paddle board, skis and boards for whatever activity you desire. It's all here right in Lake Tahoe for family adventures. Needless to say, you'll have so much to do, you'll have to come back for a return visit for every season.Take advantage of our spring and fall spectacular rates! NOTE: This owner has installed exterior only security cameras over the driveway and front door of this home. "We feel like this is the perfect ski chalet with modern amenities. We literally drove 5 minutes to get to Heavenly and the Stateline fun!" "The April house was the perfect mix of cabin and luxury. Appeases my wife with the new kitchen and bathrooms but has lots of wood inside so I feel like I'm in a true Tahoe cabin"